How do we sustain lasting change? Change management is a a common phrase. So is the adage, “Don’t keep doing something just because it’s the way we’ve always done it.” So, let’s assume you are leading a group, school, district, or company through a change. What steps do you take to sustain focus, and maintain the route to lasting change? Any change worth pursuing must begin with a clear vision. This could come from the leader of the organization or a leadership committee, but it needs to be simple, focused, and achievable. This vision has to be supported by goals that will lead the group through the change, and through the time period following the initiation. The vision and goals need to be well-communicated among all the stakeholders. In a school system this could include the school board, administrators, teachers, other staff members, students, parents, and community members. If the vision and goals are well-developed, and well-communicated, with the opportunity for stakeholder input, then the change is more likely to be received positively leading to widespread buy-in. I have heard of schools where the teachers are told that they will be implementing a 1:1 technology integration in a month with no training or input. You can guess how well those endeavors play out. Fear is the greatest hindrance to positive change. People fear that they won’t know enough to implement the change. They fear they will be expected to do “one more thing” with nothing taken off their plates. They fear that the new way of doing something won’t measure up to the tried and true methods they are used to. These fears can mostly be addressed and assuaged by proper training at the onset of the project. This training can have a hundred different looks to it: observation, professional reading, one-on-one coaching, whole-group direct instruction, etc. The point is to offer something in a nonthreatening manner to show your people that you support them and are doing this to help all involved to be better. I’m so thankful that coaching/modeling is a big part of my work as a consultant. I get to build relationships with the people I work with to offer them ongoing support. People need to know that they won’t just have new information and expectations dumped on them at the beginning. It’s the continued, personalized approach that makes such a big difference. Just like every child doesn’t learn in the same way, on the same timeline, neither do adults. Through coaching, the adults can be supported at their exact point of need. Are you seeing a trend here with #3-5? You can tell that I highly value learning as a major part of the change process. No one can stay at the top of their game if they aren’t continuously learning. By providing ongoing professional development, the leader keeps the vision and goals in front of the stakeholders, showing that it’s a continued focus, and proving that she is willing to support her staff long-term. 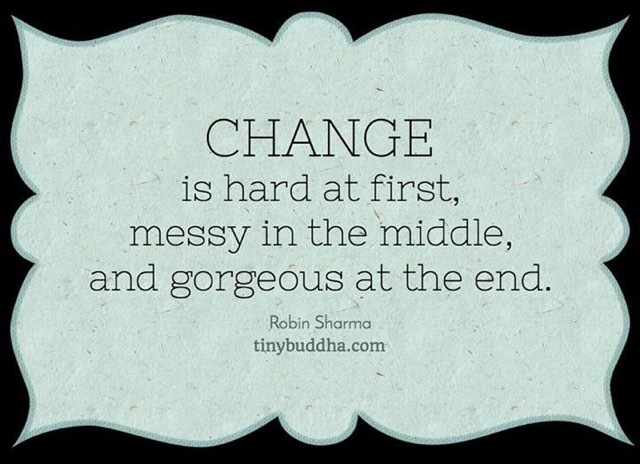 Change is sometimes difficult, and inevitable. How you set up the process will determine its success. This entry was posted in Leadership, Professional Experiences and tagged change management, professional development. Bookmark the permalink.